The NPX blueprint is quite a challenge because it requires the mastery of two hypervisors, the Nutanix XCP eco-system (including Dell OEM appliances) and the silos of Enterprise Information Technology (Compute, Network, Storage, Backup/Recovery, Security, etc.). 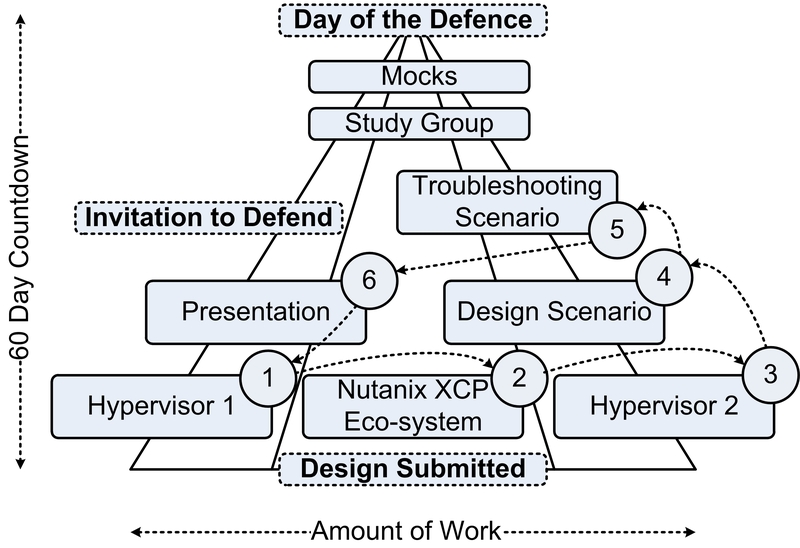 Once you have submitted your NPX document set, you have 60 days to get ready for your defence, with the belief that you will receive your invitation to defend on day 30. The diagram below shows a pyramid, where the apex is the day of the defence (D-Day). You can see that the first 30 days are critical in completing a significant amount of work in each area to ensure that you peak on day 60 (D-Day). You should already have an NPX Skills Matrix that you have been using to measure and monitor your progress. Rather than complete each area before moving onto the next, I have found it much more effective to spend 1 or 2 days on each area before rotating to the next. This keeps things fresh and interesting during the countdown to D-Day and protects you from burning out or losing interest. This method I used unconsciously during my VCDX preparation, but had to rethink and fine-tune for NPX due to the larger blueprint.